Here's the project that I came up with! Hubby and I recently bought our first coffee table together. After shelling out the cash I'm very protective!! 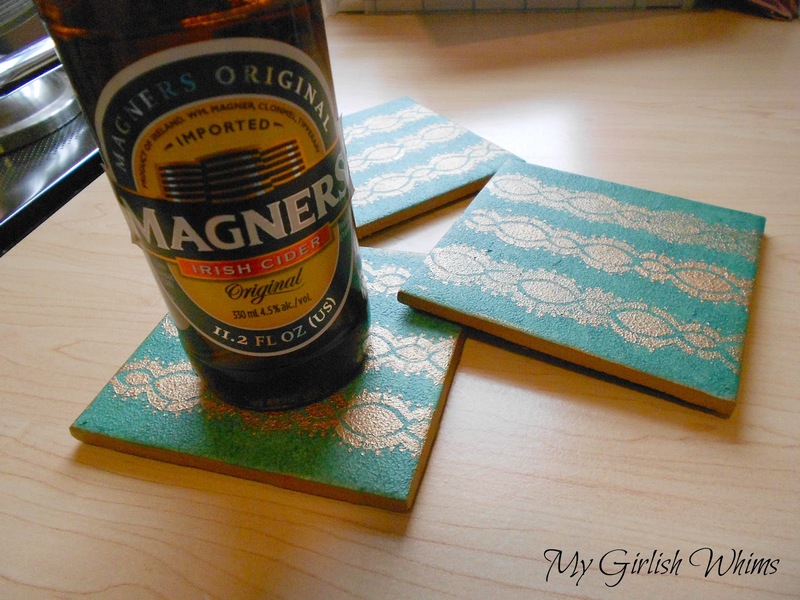 I knew some cute coasters would be in order to protect my new furniture. I picked up four coasters from Lowes for about 16 cents each I believe. Very cheap!! I mixed together two colors of the Martha Stewart Gloss glass paint to use for the base of my coasters. I used the handy little sponge pouncers that come with the line to apply the paint. After pouncing I used a small foam roller to give it a more even texture. I tested out one of the metallic paints to use on the stencils. I used another one of the other small foam pouncers to apply the stencil to the coasters. After they were done cooking and cooled, I flipped them over and hot glued some felt to the back so they don't scratch my new coffee table!! 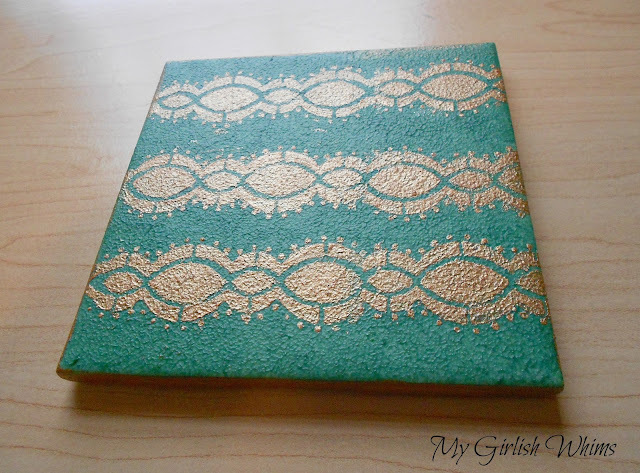 As an afterthought, I painted the sides of the coaster the same color of the stencil. 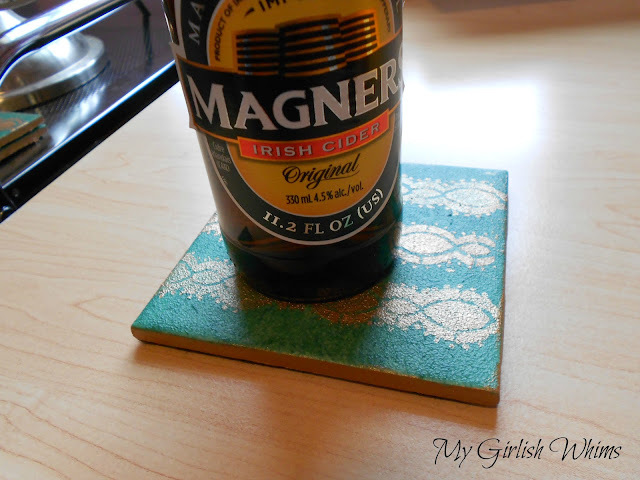 Testing it out with some hard cider - yum! Here they are on my coffee table - love! Follow Plaid, the manufacturer of these crafts online! 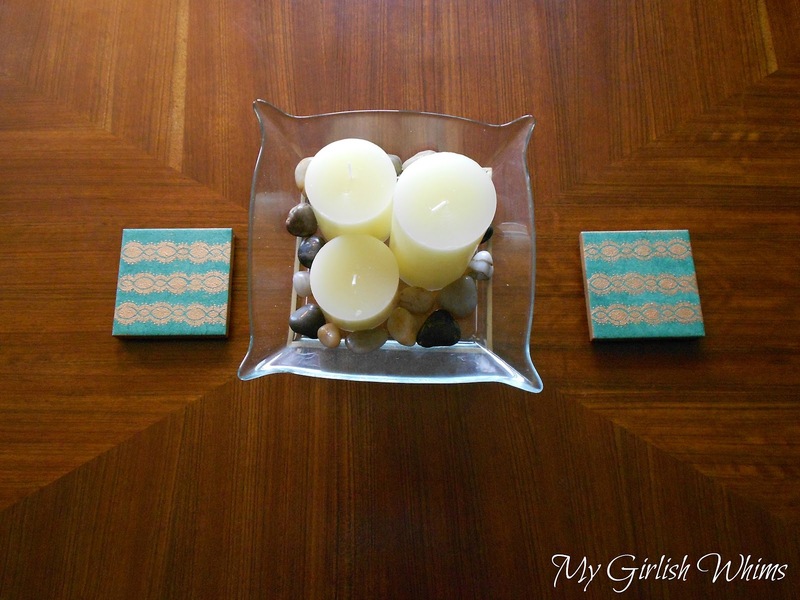 I wrote this post as part of a paid campaign with Martha Stewart Glass Paints and Blueprint Social. The opinions in this post are my own. Check out some of the other great projects made with the new paint line! What a great tutorial! That paint sure opens up a new world of possibilities to me. Very cute! Love this idea. What a great idea! I love how you mixed the two paint colors to come up with your own color! Cute idea! Love the texture you gave the coasters! Very nice! I got a ton of tiles from Freecycle planning to make mosaic backsplash. There are sooooo many I was wondering if what you did would work! Thanks.